Digital Marketing is the medium utilized for the marketing strategies that are carried out on the infamous internet. The term Digital Marketing pretty much explains itself. It signifies a shift in the old school ways of marketing. Undeniably, there is a wide Digital Marketing potential at the moment as digital marketing is the new age mass media that functions entirely with the help of the World Wide Web and has proved to be the quickest means of instant communication. There are several ways to become a digital marketing specialist. If you have recently completed a course in Digital Marketing, then the task at hand becomes a little bit easier. In today’s day and age where people are inseparable from their smartphones and other electronic gadgets, digital marketing is an affordable business tactic which companies/brands are looking up to. Talk about striking while the iron is hot! Digital marketing is centered on the usage of various online mediums and assets to reconnect with current customers and loop in prospective clients. Such online mediums and assets include; online website, blogs or vlogs, e-books and white papers, advert infographics, email leaflets, search engines, social media handles (includes Instagram, Twitter, and Facebook), increasing digital visibility (includes PR and reviews), branding assets (includes logos and fonts), lookbooks and online posters/brochures. Recently researches reveal that people of all ages are spending double the time online than what they did a decade ago. Each one of us is guilty of this social crime! However, on the other hand, this also signifies the audience which was originally available offline is now also accessible online; thereby, opening doors to online marketing strategies. With time, since all business have accepted and strived hard for an online presence, the need for professional digital marketing is now more than ever. Also, businesses that exist only on the web need to put up double the effort to grow online sales because, without online visibility, their business does not even exist. B2B companies can fish for online leads and then filter them through digital marketing. They can generate leads and filter out causes of potential clients to contact their sales personnel on their own. B2C companies also benefit by benefitting the client by providing a full look at all the objects that they have for sale without checking the inventory physically every single day. A satisfied client always comes back! Distinctive to offline marketing, digital marketing is manifold effective at measuring ROI of the effectiveness of the marketing strategies put in by the company. If digital marketing is effective, online lead generation majorly converts into clients. Unless it is a flop product, poor digital marketing can be blamed for lack of sales on an online business. To check the effectiveness of your online marketing, tracing your steps back up to the first step of interaction with the client is of high value. This enables your company to identify the trends, patterns, and habits of your customer’s shopping which in turn is a boon to your team of Digital Marketing Specialist. They are responsible for newer strategies, and with this data, they can refine marketing strategies. That kind of value added to the table can’t be ignored given that a smart sale and marketing alignment attributes 23% yearly increment rates for the organization. With poor marketing skills at your disposal, your company could also be prone to a 4% decline. As long as your job is still a hot commodity in the industry, you might want to look at your options and then narrow it down to the best. For beginners, every company needs an online presence for which one needs the skill. A company functioning on a big scale needs a digital marketing manager dedicated entirely to the web-based aspect of marketing to ensure that part of the marketing is taken care of. Let’s start with the top names in the Digital Marketing field and the kind of work they’re into. Big leaguers like HP, IBM, Flipkart, Accenture, and Mahindra are few of the top names off of my head. The thing about this job title is that it is vital to each company regardless of the industry they’re in. A tech company, a car manufacturing company, an online departmental store or a clothing brand; each one of them needs a Digital Marketing Manager to handle their online visibility and make sure it never falls behind. 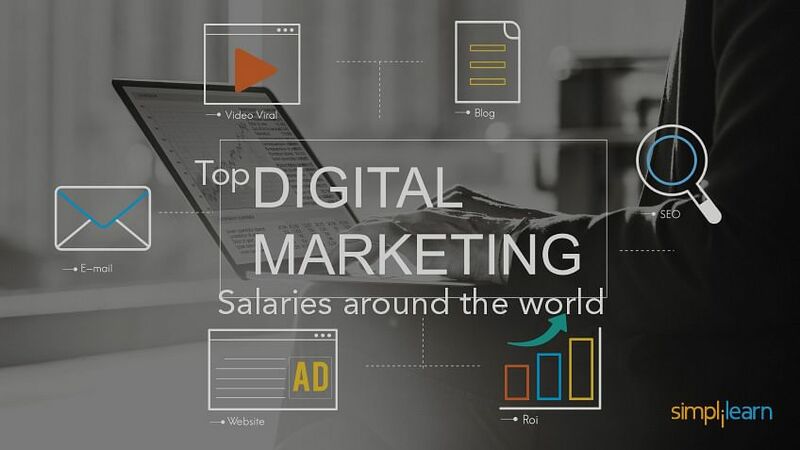 Digital Marketing salaries are a few of the highest paying jobs around now. We know, in the end, it’s all about the digits! With car manufacturing companies like Mahindra offering up to INR 6,75,000 annually for the position of Digital Marketing manager whereas a multinational company like Accenture pays up to INR 24,24,000 annually. Your job as a digital marketing manager would include a lot of great growth opportunities if you have the knack for it. If you’re someone who is internet savvy, has a deep understanding of marketing and consumer interest and loves to write, digital marketing is the apt job for you. The big tech leagues like IBM offer up to about INR 10,00,000 yearly for a digital marketing manager. The average pay of a digital marketing manager varies across countries even with the same job title. However, it may see a stark difference based on the company you’re working with and the job description that entails. It might interest you to know that Australia is the highest paying country for this job specification. A Digital Marketing Expert in Australia is on an average payroll of AUD 82,166 (USD 62,444.52) on an annual basis. Going by the trend, the basic hourly pay is AUD 42 (USD 31.92) per hour which is approximately 1.5 times higher than the Australian average salary statistics. Australia offers a pretty lucrative deal given that the fresher level positions pay up to AUD 58,000 (USD 44,078.84), and employees with experience get paid easily up to AUD 115,000 (USD 87,397.7). In the prominent state of Netherlands, the average pay for Digital Marketing experts varies from a whopping €35,000 to €57,000 (USD 38,767.1 – 64,990.55). Experts in the field of Digital Marketing in the US earn an average salary of $47,900 annually. On the lower end, freshers in the field can get paid up to $35,000, which has a scope of going up to $63,800 for the best professionals. According to leading corporate website, the average pay for Canadian Digital Marketing Specialists is C$47,820 (USD 37,127.22). Here, fresh employees can easily get paid up to a basic salary of C$36,000 (USD 27,900), whereas experts with years in their resume get a hike salary of up to C$67,800 (USD 52,650). That’s about C$28 (USD 22) per hour wage rate, which is about 15 times more than the average Canadian salary. In the Queen’s land, the average Digital Marketing expert’s pay is £33,390 (USD 43,061) annually which leaves us at about £17 wage rate (USD 21.90) each hour). Entry level professionals get paid up to £22,000 (USD 28,650); while, top professionals of the field can expect as much as £45,000 (USD 580,600). In Ireland, any digital marketing manager’s average salary would approximately stand around €36,000 (USD 43, 125) per year. This figure leaves us at an hourly wage rate of €18 (USD 20.66), which is about twice more than what is the Irish median salary. €25 000 (USD 28,650.9) is the basic salary for a fresher. Meanwhile, €52 000 (USD 59,287.8) is the average salary as per industry standards for highly experienced recruits. Austrian digital marketing managers can get paid up to €30,800 (USD 35,116.62) annually which equates to a €16 hourly wage rate (USD 17). The salary varies from €23,000 (USD 26,000) for a fresh recruit up to €42,000 (USD 48,000) for experienced professionals. In Italy, a Digital Marketing manager can negotiate for an average salary of €30,000 (USD 33,876) annually, which would convert into an hourly wage rate of €15 (USD 17.24). This job in Italy would pay you twice more than what an average Italian earns. Wages for freshers start at €20,000 (USD 22,900,) hiking up to €42,000 (USD 48,000) for top performing employees. In Singapore, Digital Marketing managers get paid anything between S$37,800 and S$60,000 per year (USD 28,130.14 – 43,250.15). The range in salary is mostly determined on experience years, field, and company strata. In Spain, all Digital Marketing salaries range between €25,000 and €32,000 (USD 29,636.00 – 36,300.65) per year. Digital Marketing Expert – What’s the next step? With a keen interest in your job and how much value you add to the business, in no time you should get the hang of your new job. Since this is a job that requires your creative aspects as well as your business acumen, you do need to keep up good strategies up your sleeve. Always stay on top of any new marketing techniques, lead generation as well as enhancing the use of already existing mediums. Starting with a position as a Digital Marketing Manager, you can grow towards the position of a Digital Marketing Expert and eventually, a Digital Head.